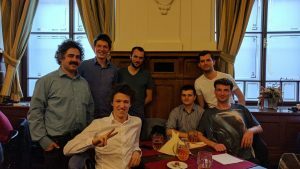 Based on results presented on our student research conference IIT.SRC 2017, representative works from each category were nominated and their authors offered participation in Czech and Slovak student research competition SVOC in mathematics and informatics. 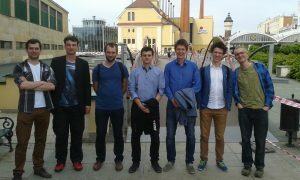 Long story short – a fellowship of The Seven (six FIIT STU students regrouped with nearby FMFI UK fellow student) took an adventure journey to Pilsen, presented their works, grabbed 4 prizes, gained some theoretical and practical beergineering skills and returned safely home to share their experience and tell the tales. In Pilsen, we all appreciated the modern public transport system featuring ticket machines with contactless payments present inside vehicles. Since only single one of all our cards was compatible with the machine, it fell into memory as The One (card to pay them all). 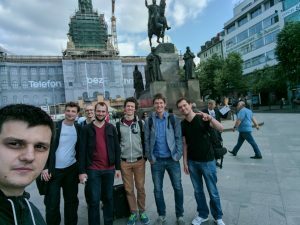 We took the bus to hotel, and after a dinner, we immediately started our preparation for next day’s competitive presentations. 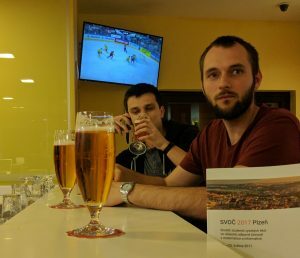 Too bad it was the day of ice hockey world championship finals thus we also prepared with beer. The next day was The Day. A bus took us to university where the event took place. After a short introduction, we presented short presentations about our research works in thematic sections. At the noon we were pleased to find draft beer in campus canteen. What a lunch! The afternoon was a time for break so we split up to get some rest and explore the campus a bit. 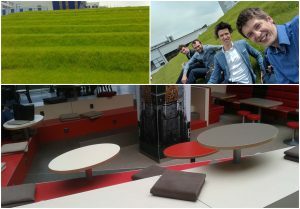 We came across places we found very suitable for work, study or rest, such as these natural “grass benches” or this coffee place. 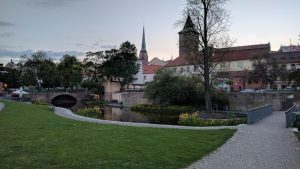 Later on, we met up in the hotel to catch the bus provided by event organizers, which took us to Plzensky Prazdroj where we got a free tour of Pilsner beer factory with a presentation of all its historical attractions and interesting facts. 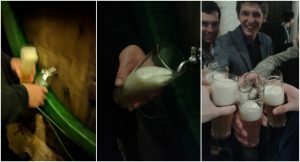 The tour was finished in the beerhouse cellar by an exclusive experience of fresh beer tapped directly from the barrel into glasses. That particular moment brought the fellowship back together and was unlikely to be forgotten. 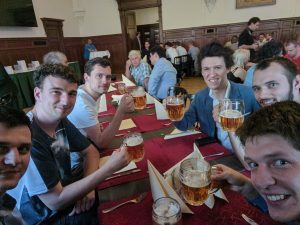 Finally, after this amazing tour, we were up to results declaration and celebration dinner which took place in The Art Nouveau Hall (representative hall Secese) in the area of Plzensky Prazdroj. After few appreciative words, for each category, awarded places were announced and winners received their prices. We were also impressed by the amount of girls participating in the mathematical categories. Importantly, everyone received two magical jettons which eventually turned into big (0,5l) beer each, so we used it to flush the delicious dinner. We also couldn’t miss the chance to talk to the jury, and subsequently, couldn’t resist taking a photo with one of the judges who reminded us of professor Einstein with his amazing hairstyle (docent Vinař). As we have learned through experience and discussion, difficulty of technical realization was one highly weighted criterion, opposite to scientific contribution of proposed method, at least in Informatics categories. This information may be beneficial for future participants, regarding preparation of their presentations. We used the rest of the evening to network with other participants, discuss our projects and later on to explore the center of Pilsen. The old town felt very calm in its late hours, with its park and large square, nobody hurrying anywhere, we could enjoy the mood of that place. Next day, we left the place to continue our journey back to Bratislava on rails. Although there was a local outage of power cable infrastructure, we only waited an hour or so and luckily, everyone caught their train from Prague.